“Live Beyond The Spheres” is an epic live album spread over three CD’s and if you have the time to listen to all two and half hours, it is well worth your while. This is top draw live Power Metal. If you are already a BLIND GUARDIAN fan, you will not be disappointed. 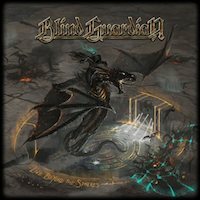 Power Metal has grown on me over the years as I have become to appreciate the musicianship coupled with showmanship in BLIND GUARDIANS music. In fact, they could also be described as Progressive Metal. Formed in 1984, the band has released 10 studio albums since their debut in 1988. Their last live album was 14 years ago. “Live Beyond The Spheres” was recorded on their 2015 tour to support their latest studio album “Beyond The Red Mirror”. It is a very European style of Metal that has all the classic hallmarks you would expect from a German Power Metal band. So, there are plenty of melodies, sing along choruses, guitar shredding, orchestral and sonic story-telling. The bands back catalogue is extensive. They do manage to fit in several tracks from the latest album, many of their classics and a few deeper tracks. The crowd is really involved with the band and there are many nice crowd chants in dedication to the band and their songs. Twenty-two songs is not easy to review but I will pick out several highlights. The first track is from the latest album “Beyond The Red Mirror” and you get the full dramatic choir chanting the intro/outro to “The Ninth Wave” providing a brilliant live feel. The track reminds me of the British band MAGNUM and is one of their more Progressive style songs. I have to mention second and third songs “Banish From Sanctuary” and “Nightfall” as they are two of the bands early classics and are superb live. Especially “Nightfall” with its crowd singalong. This track is a touch Pomp Rock rather than the bands mainly Power Metal style. This sounds similar to ANGEL (the classic 70’s American Pomp Rockers). There are a lot of orchestral moments with what sounds like a number of backing singers. This provides for a great live sound and atmosphere. Stand outs are “The Lord of The Rings”, “A Past And Future Secret” and “The Bard’s Song” which fall in to the more acoustic category. These have a progressive feel in the vein of JETHRO TULL or MARILLION in various moments. These songs provide for good crowd participation singalongs. There are lots of Melodic Speed/ Power Metal tracks too. “Twilight of the Gods” and “Valhalla” particularly standout as great Power Metal workouts. The musicianship is at a super high level. The guitars battle each other but are always in control. There are a couple of almost DRAGONFORCE moments in the guitar soloing. However, BLIND GUARDIAN are original in their songwriting and compare more closely to an IRON MAIDEN/HELLOWEEN mash up with extra added orchestration. “Live Beyond The Spheres” really is a very enjoyable sonic live experience. The guitars are simply superb and the songs are Singalong Metal, in a good way. I always like to feel as if I’m in the crowd listening to a live album and this encapsulates the live feel perfectly. You can’t ask for much more from a live album than "Live Beyond The Spheres".